A history of two destroyed currencies might well have precluded Israel from selling its own shekel bonds. So, back at the turn of the 21st century, it seems to have invented a counterfeiting scheme to sell U.S. bonds to Americans. It now issue bonds in America payable in dollars, not shekels. The problem is, the program was a success, and Israel now owes, or will soon owe more dollars than it can ever repay because it cannot print US dollars, as it prints shekels. What is Israel's solution? Sell more dollar bonds, and use the proceeds from the new bonds to pay off the old bonds! In this article I will differentiate this practice from a Ponzi scheme. "One difference between Bernard Madoff's scheme that sent him to jail, and the sale of I-dollar bonds is that Israel got permission to sell from the SEC; Madoff did not!" Israel may well be the power behind change in U.S. state laws. The Development Corporation for Israel (DCI), with a New York address and U.S. stockbroker connections, is the bond monger that has been working this project for years, with few noticing. I discovered Israel dollar bond huckstering only when someone told me of an impending change to the laws in the State of Colorado, such that only Israel could benefit, and Coloradans, especially state employees, could only lose. It seems DCI has set up 25 sales offices across the U.S. to market Israel's "Jubilee" bond series seven. It came as a shock to me that "Jubilee bonds" (probably first issued in 1998) are denominated in dollars, not shekels, the currency I had to buy and use when I was in Israel. Can a foreign state legally sell bonds denominated in U.S. money, and why would they want to? Israel cannot print dollars, so how can it commit to repaying hundreds of billions of U.S. dollar bonds? The answer seems all too obvious: Israel doesn't plan to repay these bonds. It is a small country, smaller in business than Finland or Greece, with less natural resources than the State of Colorado or Arizona. Eventually the bonds must fail, because the only way Israel can come up with tens of billions of dollars to pay off what they tell us is their seventh series of dollar bonds, is to issue many billions of "New Shekels" (NIS) to buy U.S. dollars in the world currency market. But this shekel for dollars scheme can not work for obvious business reasons. If Israel sells billions of NIS, a very thin currency, will drop in the world currency market, as did the "Old Shekel" in 1985. This would destroy Israeli businessmen and investors because they have their assets in NIS and are doing business in NIS. Since Israeli politicians cannot allow this to happen, the dollar bonds will eventually have to be allowed to default, even though Israel claims it has never "missed a bond payment". The only other course would be for the United States government to take over the Israeli-issued United States dollar bonds, and this would be an act of criminal theft against every American citizen, too brazen to be contemplated. Contrary to what it claims, Israel has poor credit history (forget meaningless ratings). In its brief 65 year history, Israel has already cast two of its currencies on the trash heap of worthless paper money. If investors understand this, they won't touch Israeli bonds; that's why these Jubilee bonds are denominated in dollars, not NIS (new shekels). This history of devaluation is explained in my paper, "The Ugly History Of Shekel Bonds." The appeal of the Jubilee bonds is that DCI offers maturity dates similar to U.S. Treasury bills, notes and T-bonds, but returns double the going rates for U.S. instruments. Obviously, the target market for the bonds is large investors who buy fixed income, ultra conservative treasury instruments. While the income is low, U.S. issued dollar bonds cannot default because the U.S. government can print money to pay them off. Not so when Israel issues bootlegged bonds, they must eventually default because Israel can not print dollars. The U.S. dollar is America; we own it, like a copyright, it represents our values. I ask, who gave this foreign state the right to sell bootleg U.S. dollar bonds in competition with our own government, which we are told is in desperate need of dollars to avert another financial cliff? It is the much discredited U.S. Security and Exchange Commission that has licensed the sale of these bond in our 50 states in competition with our own U.S. securities. 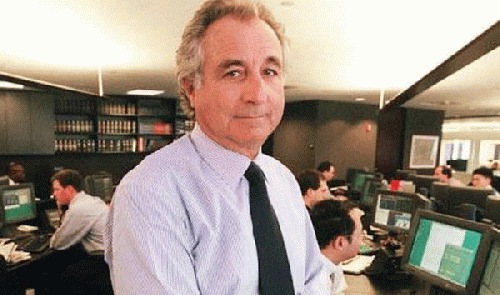 One difference between Bernard Madoff's scheme that sent him to jail, and the sale of I-dollar bonds is that Israel got permission to sell from the SEC; Madoff did not! Someone with Israel's interest at heart is instigating changes in U.S. state laws to allow state controlled money, to be invested in Israeli bonds. The best place to stop this abuse is at the state level. Our 50 states are all strapped financially and have little long-term money to invest. The real target is not the Treasury, but the biggest investment accounts in the states--the employee retirement funds--which have a lot of money to invest. In Colorado, retirement accumulation is in its 80th year and PERA (Public Employees Retirement Association), according to its own statement, holds over $37 billion in "global equities" investment, of which $8 billion is fixed income. The pension plans in other states are much larger, some with more assets than Israel has. That is enough money to keep Israel going for a while. So how does Israel, a foreign government with bad credit, which according to its own "prospectus" cannot be sued if it does not pay... how does this Israel tap into these huge caches of cash owned by U.S. state employees, but administered by agencies of those states, and overseen and limited by laws governing the investment of such moneys? Israel appears to be in the process of changing these state laws, one at a time. In Minnesota, citizens are suing the states to try to stop such investment. In Colorado, the bill pending in the state legislature is Senate Bill -176-13 that "would "authorize the State Treasurer to invest State money in debt obligation backed by the full faith and credit of the State of Israel." The Development Corporation for Israel advertises: "Diversify with Israel Bonds." Its sales office in Arizona is located on posh South Lakeshore Drive in Tempe. Israel is currently offering $1.235 billion of Jubilee Fixed Rate bonds, Seventh Series. The prospectus filed with the U.S. Securities and Exchange Commission on December 15, 2010, (updated) tells us that as of December 31, 2012, $735 million, about half of the total issue, had already been sold in the U.S., and that $74.1 million in sales commission will be paid to the bond salesmen, who could be salesmen for American banks and stock brokers. So the U.S. Securities and Exchange Commission is complicit in this bond scheme. The Jubilee bond literature states: "Israel bonds are a reliable means of preserving capital, diversifying portfolios and obtaining protection from market fluctuations. Israel has never missed payment of principal or interest since the first Israel bonds were issued in 1951." Is this true? Yes, a small technical truth that sells a big lie. Israel may not have missed a payment because the bonds issued up to 1986 were redeemable in the Israeli Pound and later the Old Shekel, both of which were diluted into the ash can of money history. Israel did not have to repudiate its debt; it just diluted the currency by printing more and more, and went on paying off creditors with worthless money, like hundreds of overextended governments throughout history have done.